The Broke and the Bookish : Julia Reviews the Pun Also Rises + Giveaway! Summary What do the following have in common: Ben & Jerry’s Cherry Garcia ice cream, Disney’s recent movie Gnomeo & Juliet, London wine bar “Planet of the Grapes”? They are all puns…which usually elicit either a quick chuckle or a loud groan. We are surrounded by puns. Be it the name of a store or movie, a headline in a newspaper, and advertisement on a billboard or characters in books and TV shows, puns show up every day. In some ways, we are experiencing a pun renaissance. 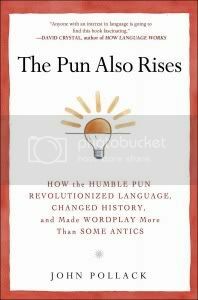 The Pun Also Rises is the definitive account of the humble pun, its history, and why punning still matters. Author, John Pollack – a former Presidential Speechwriter and winner of the O. Henry world pun championship – will lead you on a remarkable journey through time, culture and language. Rich with anecdotes, history, pop culture, neuroscience, literature, anthropology and humor, this book will inspire every reader to reconsider what they think they know about puns. The Best Part: The publisher is offering one lucky winner a free copy of the book! If this book interests you, just leave a comment with your email address. The winner will be drawn Monday, May 2nd. I will contact you for a mailing address. The book will come directly from the publisher. US/Canada only please. How fun! I'd love to read it! I love books like this and I am forever spitting out puns by accident. Hahaha! hlindskold [at] btweenthecovers [dot] com. It sounds really neat! I would definitely like to read it! This seems right up my alley! Ooh, I just read a language/grammar book and I'd love this one! My dad is the master of groan-inducing puns. I love reading origin of words books and never thought there would be a book about puns. My favorite ones are those that happen by accident. Please enter me in this contest. I'm further afield so won't enter. Just wanted to say this looks like an interesting book I read I Is An Other a while ago, which is a similar book about metaphors (review on my blog), which I found very interesting to. Sounds so interesting! One of my best friends loves puns and even enters a national pun competition every year. I'd love to read it! I would love to read it and use it in my English classroom! I do a lesson on puns each year when I teach Romeo and Juliet to my freshmen students... I think this book could be a great help for that lesson! This book sounds really interesting. I love reading books about language too. I love books on language, and would love a book on puns! I totally fail at puns but I do appreciate them when others use them! Great review, thanks so much for being on the tour! That sounds like a fun read! I love learning about language too! My husband is a HUGE fan of puns, and would love to read this! I love puns - my boyfriend is the king of puns. I hope I win. Please enter me. This sounds really cool! I'd love to learn more about puns and perhaps find new ways to use them in my own language. I love puns! Thanks for the giveaway. Oh my gosh, I *love* puns, and I'd love to read this book.